While wandering the web I came across one of those wonderful specialized blogs. The Moleskinerie page is dedicated to news of the Moleskine notebook. The uses to which people put these things inspires heavy note-taking, scrapbooking and sketching. The etries feature lots of close up shots of notebook pages with watercolor and pastel miniatures, in-depth discussions of good pens to use, hacks for organizing one's life around the little black book & etc. Although I'm currently in the minority there with my use of the Miquelrius grid ruled notebook or the big sketchbooks, my current pen of choice shows up--the Pilot G2. 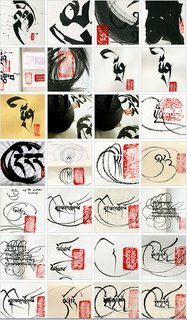 Among the great finds from the early days of the blog are the works of Nathanael Archer, a talented calligrapher who centers his work around the Tibetan language, but appears to also do work in Hebrew and Arabic styles. His Tibetan work is reminiscent of that of Chogyam Trungpa in its bold, fluid strokes and postmodern aesthetic. The Styn family holds its annual Easter Beer Hunt. Footage courtesy Halcyon. Our family morphed the traditional Easter Egg Hunt into a Beer hunt when we got older. Here's some footage from the fun. I'm such a big kid that when I came out of the church this morning and saw all the plastic eggs "hidden" on the lawn I had to physically restrain myself from picking them up.